The Onyx M-24 In-Sight Manual Inflatable Life Jacket provides comfort, safety and peace of mind for the sportsman, flatwater paddler or recreational boater. You won't even know you have it on until you may need it. This neoprene life jacket has reflective piping for greater visibility, and the universal size fits adults over 80 lbs. 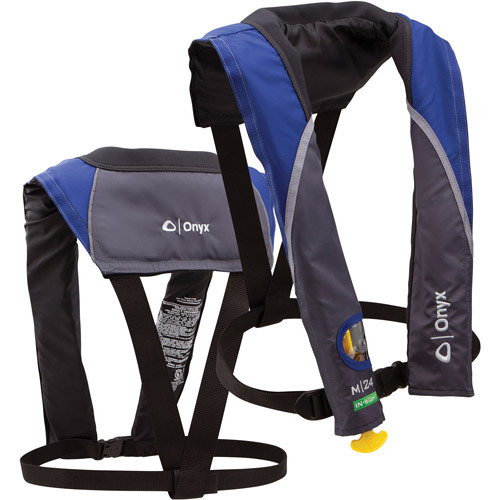 Crafted with durable Ripstop fabric, which resists tears and punctures, the blue Onyx Life Jacket keeps you cool in warm weather without limiting movement. The lightweight, comfortable and slender design and the soft neoprene neckline allow for all-day comfort. This item is not approved for children under 16 years of age. I like it because it is lightweight and will not inflate til you pull the cord or blow it up.